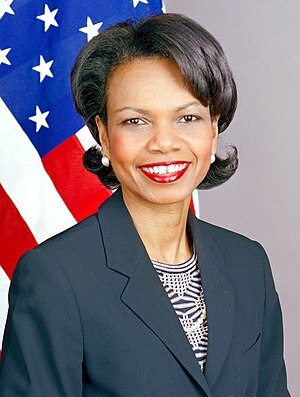 Condoleezza "Condi" Rice served as the United States Secretary of State, and prior to that, National Security Adviser under President George W. Bush. She was also the provost at Stanford at some point. She got her Ph.D in political science at age 26, so actually she is that smart. An oil tanker was named after her. As National Security Adviser, she received a memo titled "Bin Ladin set to strike in the US" from the CIA. She didn't really act on this memo. So maybe she wasn't really that smart. Sometime before 2009, certain Estonian wizards tried to murder her... with their thoughts (over the Atlantic puddle). The police refused to look into the thoughtcrime. Speculation is that they were too busy laughing. Dictators seemed to find her really hot. Muammar al-Gaddafi had a scrap book full of pictures of her and described her as "my black, African queen" and Hugo Chavez said she found him irresistible (citation needed, Hugo!!). This page was last modified on 23 May 2017, at 00:33.